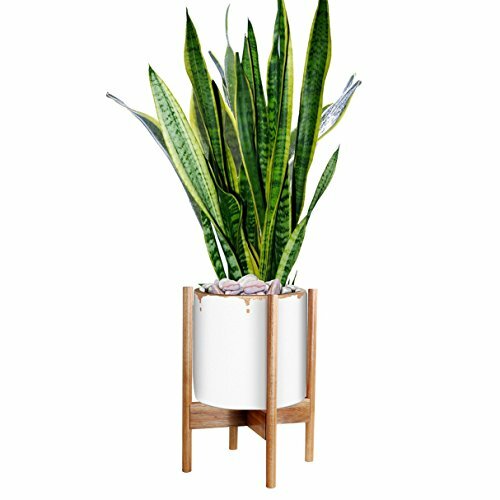 Mid century modern plant stand, Inspired by the 1950's, this beautiful mid century style plant stand is the perfect decor piece for any room--featuring Round legs. Dimension: Dia 11", Height 16.3". suitable for the round planter which largest diameter is 11", larger than 11" diameter can't be use with this item. Mid-Century Modern Design: Inspired by the 1950's, this beautiful mid century style plant stand is the perfect decor piece for any room, featuring ROUND legs. Sturdy: The stands have been stress-tested at over 100LBS to ensure it can withstand the weight of even your heaviest plant friend. Acacia Wood: Handmade from solid wood which is sturdy and classic. Match to any plant pots. Easy Installation: Simply stand it up and insert the cross bar in the notch, then twist the screw into the hole of the wooden planter, and tighten it up. If you have any questions about this product by GLOSOM, contact us by completing and submitting the form below. If you are looking for a specif part number, please include it with your message. Giantex 3 Tier Folding Wooden Plant Stand with Pot Shelf Stand Display Rack for Indoor Outdoor Garden Greenhouse, 24" x 15" x 37"